Teena Johnson's modest Uptown storefront. 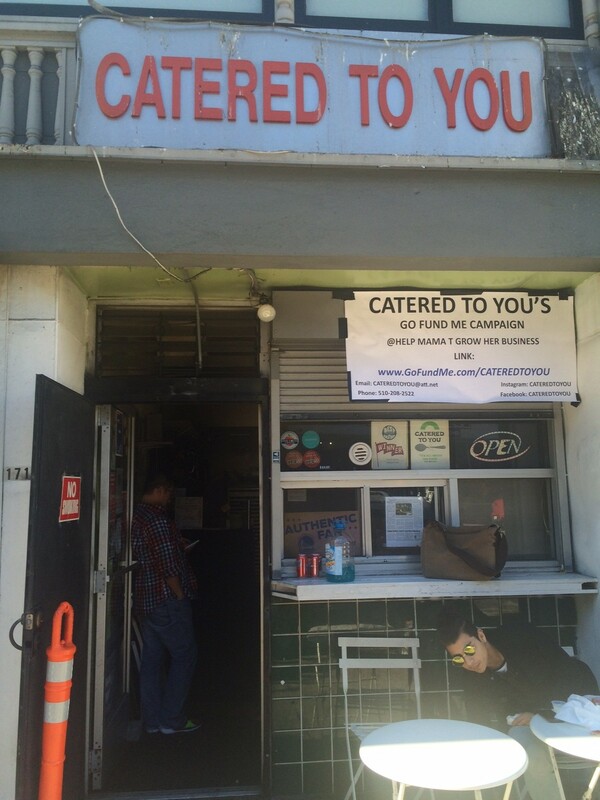 The fish sandwich at Catered to You (1711 Telegraph Ave.), a no-frills takeout window in Uptown Oakland, is deceptively modest in appearance. Its component parts are standard-order: a few pieces of cornmeal-dredged basa fish, hot sauce, lettuce, tomato, and onions, all on a sesame bun. It's only when you bite in that you realize how high the sandwich is piled with fish — and how ethereally airy-light that fried fish is, and how perfectly it melds with the hot sauce. 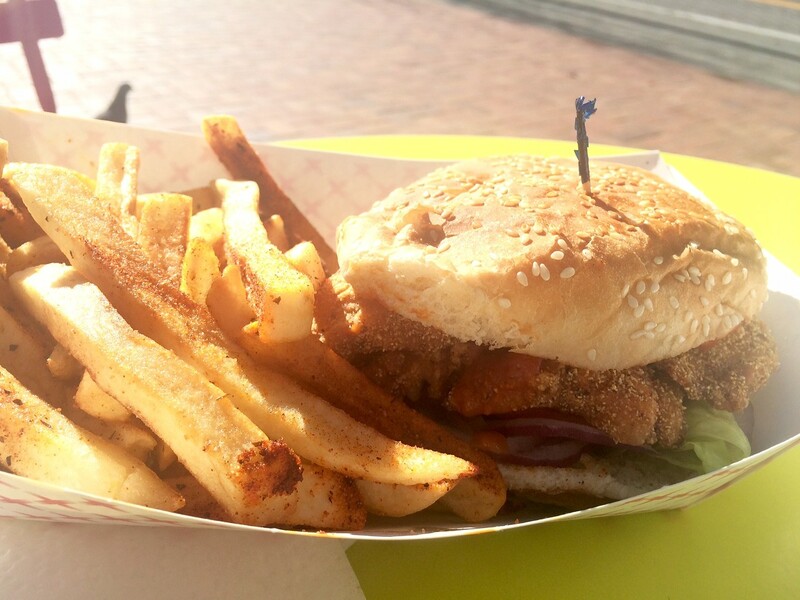 It's a memorable sandwich, best eaten while sitting on the curb, or at one of the small outdoor tables at nearby Latham Square. And, as so many parts of Oakland become more and more upscale, it is precisely the kind sandwich that's worth saving. 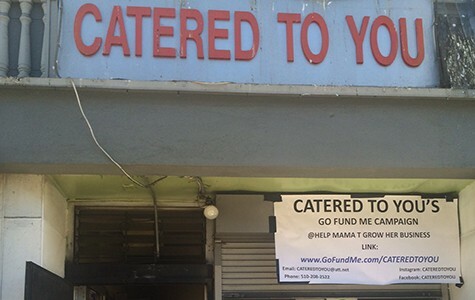 That's the idea behind the $11,000 fundraising campaign that Teena Johnson, the 62-year-old proprietor of Catered to You, has launched on the crowdfunding site GoFundMe. The money would help Johnson — or "Mama T," as her regulars call her — upgrade her tiny, 300-square-foot kitchen and extend her hours. In other words, it would help keep her business competitive in the face of a rapidly changing Uptown neighborhood. A former banquet facility manager, Johnson opened Catered to You in 2008, fulfilling her long-held dream of running her own place. 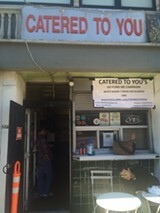 She started out selling straight-up soul food — red beans and rice, smothered chicken, and things of that nature — but she quickly found that those types of dishes were too heavy for the lunch crowd, and they weren't the kind of thing that customers wanted to bring back to the office in a to-go box. So she shifted to burgers, seasoned fries, chicken Caesar salads, and that fish sandwich ($10.95, fries included), which is by far her bestseller. Reached by phone, Johnson stressed that her business isn't in any imminent danger. Eight years after the Great Recession nearly killed the whole operation before it even got off the ground, the catering side of Catered for You is finally starting to pick up. Johnson said she sells enough burgers and fish sandwiches to be able to pay all of her bills. Also, unlike so many of Oakland's long-established mom-and-pop restaurants, she has a relatively stable and affordable lease situation. Still, if you look at the gleaming new eateries that have taken root up and down Telegraph Avenue and Broadway, it's not hard to see that Johnson has her work cut out for her if she wants to compete. Unlike the new crop of restaurants, Catered to You doesn't have an attractive facade — or, for that matter, any seating area to speak of, apart from two small tables set up on the sidewalk. The things Johnson would like to add are pretty basic. For instance, she wants some outdoor lighting so that customers can see that the shop is open on Friday and Saturday nights, when she stays open late (until 11 p.m. and midnight respectively). She'd like to hire another cook, giving Catered to You the production capacity to participate in food delivery services such as GrubHub and UberEats. And Johnson wants to add a deli station where she can sell pre-made cold-cut sandwiches to customers who are in too much of a rush to wait for fried-to-order fish. Meanwhile, Johnson thinks there is enough demand from the Uptown/Downtown nightlife crowd for her to stay open as late as 2 a.m. on weekends. Again, that would be contingent on getting an initial infusion of cash, which would allow her to staff up. For now, the restaurant's GoFundMe page has yet to pick up much traction. Johnson has only managed to raise $745 as of Tuesday morning. She plans to continue soliciting donations through the site at least through the winter holidays, at which point she'll pursue other funding options, if necessary. "I'm determined that one way or the other, these changes are going to happen," Johnson said.